In 1850 there were 4,531 Italian immigrants in the United States. Ten years later the number had more than doubled. With no Italian-speaking parish in New York, Archbishop Hughes worried about the growing number of Italian Catholics with no church. An Italian priest was given the charge of establishing a small chapel on Canal Street dedicated to Saint Anthony of Padua. Cardinal John McCloskey, in 1865, entreated the group of Franciscans who had settled in upstate New York to set up an Italian parish to replace the little chapel. Father Leo Pacillo responded, establishing the Italian national parish of St. Anthony of Padua in 1866. The parish used the former Free Congregational Church at 149-151 Sullivan Street near West Houston Street. Ironically, its first official act was the baptism on March 23, 1866 of an Irish baby, Elizabeth Kelly. In 1882 the land adjacent to the church, formerly occupied by a brewery, was scheduled for auction. By now the church structure was inadequate for the quickly-increasing membership and the parish desperately needed the land in order to expand. On the day of the auction, January 31, the city was hit with a major blizzard. Father Anacletus DeAngelis was the sole bidder who made it to the auction through the snow and for a bid of $53,000 purchased the property. English-born Arthur Crook, who would design several Manhattan churches, was selected as the architect. The Italian congregation asked for a structure of which they could be proud – one on a par with the Old Saint Patrick’s Cathedral. Crook created a granite faced Romanesque building reminiscent of buildings the Italians remembered from their homeland. It would be the first church constructed by an Italian community in the United States. On June 14, 1886 Archbishop Corrigan presided over the laying of the cornerstone. Inside was a tin box holding newspapers and several gold and silver coins. As the church slowly took shape, marble artisans in Carrara, Italy were at work on the grand altar, communion rails and pulpit. The marble work alone would cost $12,000. The contract for the stained glass windows was finalized, costing $10,000, and the new 2,400-pipe organ was being built by George Jardine & Son at a cost of $8,000. At last. on June 10, 1888, the church was dedicated. Stretching back 150 feet, it was 75 feet wide and rose 100 feet at its highest point. 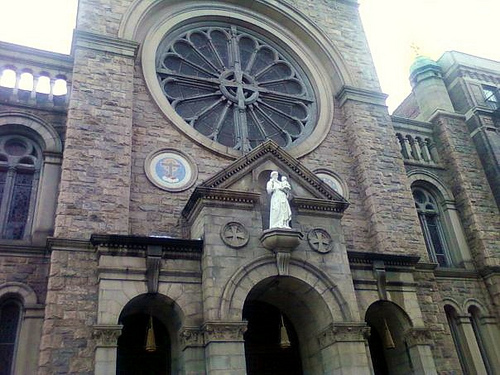 Above the central of the three entrances stood a life-size figure of Saint Anthony. Dominating the main façade was a 26-foot diameter rose window. 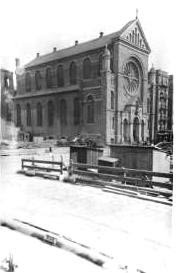 Behind the church and connected to the monastery that fronted Thompson Street, was a campanile housing three large bells; the largest, weighing 5,000 pounds was dedicated to St. Anthony of Padua; the second weighing 3,000 pounds to “Blessed Virgin Conceived Without Sin,” and the smallest at 1,500 pounds dedicated to St. Francis of Assisi. The Italian congregation had gotten what they asked for – something to be proud of. Throughout the decades the parish would be known for its colorful Feast of Saint Anthony. Although the feast started out rather solemnly, it evolved into a carefree, week-long street fest of Italian foods. In April of 1914 two young women from St. Louis sent a small box of gold trinkets to the church “expressing the hope that they might be devoted to the honor of St. Anthony.” The following Sunday the gift was announced from the pulpit. Congregants immediately began showering the church with jewelry and precious metal items. By June the priest had had a gold reliquary, studded with gems, fashioned from the donated jewelry, which was put on view during the Feast of St. Anthony that month. The darkest time for St. Anthony’s occurred on November 4, 1938. On that morning the monastery caught fire and quickly spread. On young lay brother, here only one year from Italy, perished along with a cook. Priests were trapped, some jumping out windows to adjoining buildings or clinging to window ledges praying for help. Seven trapped priests were saved by firefighters. One priest, Father Fagan, had escaped but rushed back into the blazing building to rescue Father Louis Vitale and returning again to rescue Father Bonaventure Pons. With flames surrounding him, Father Fagan jumped from a window to a roof below. He died of his burns five days later. When landscape painter Lockwood De Forest II married Meta Kemble in 1879, his love affair with things Indian and exotic was already well-established. That same year he had partnered with Louis Comfort Tiffany to form the interior decorating firm of Associated Artists. 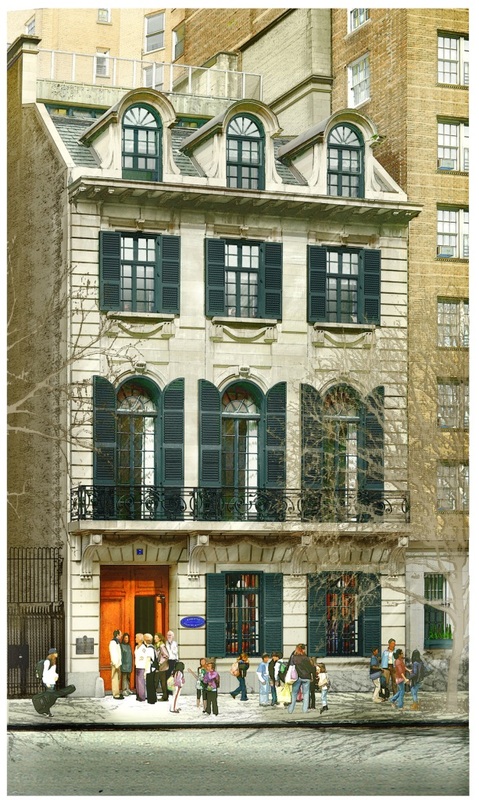 De Forest’s love affair for Indian decorative arts was manifested in the five-story home he built at 7 East 10th Street in 1887. Working with architect Van Campen Taylor, he created a residence which would have been nearly devoid of architectural interest had not it been slathered with lush Indian teakwood carving. The double-doored entrance, on sidewalk level rather than above a traditional high stoop, was framed in intricate wood carvings and a deep wooden cornice projected over the brick façade. However the second story oriel window, supported by four heavy brackets was the piece De resistance. An explosion of carved florals, animals and geometric designs, its dark teak color dramatically contrasted with the tan brick. The deep-relief carvings of the brackets were masterpieces of Indian art. A projecting, tiled roof finished the window. In 1887 America was obsessed with things Asian. However the fashion limited itself almost exclusively to Japanese and Chinese decorative arts. The De Forest House was unique. “In all the United States there is not another house like this,” said The Times. On the second floor, a huge landing opened onto the parlor on one side and the dining room on the other. The windows of the dining room were framed in intricate lattice-work and the ceiling was supported by carved teakwood beams forming squares in which were carved rosettes. The ceiling of the parlor was stenciled brass with a carved frieze. 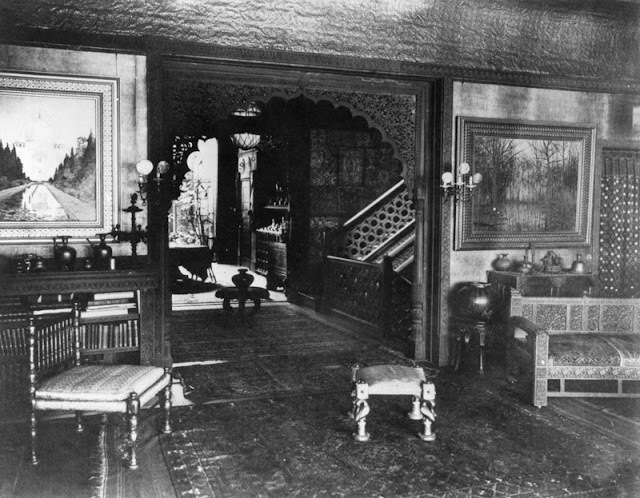 Throughout the house were piles of Oriental rugs, chests and other carved furniture, porcelains and brass. As Lockwood De Forest went about his business painting landscapes and decorating homes, Mrs. De Forest entertained. On December 2, 1903 she hosted a tea here for her debutante daughter two years later the house was the scene of a Christmas sale for the benefit of the New York Infirmary for Women and Children. Society women passed through the teakwood archways inspecting baskets, card, calendars, pottery and dolls. Here writer Rudyard Kipling, whom the artist had met in India, stayed on at least one occasion. In 1922 De Forest moved to Santa Barbara, leaving the exotic and unique house on East 10th Street forever. When the house was sold, much of the interior detailing was removed and sold at auction. 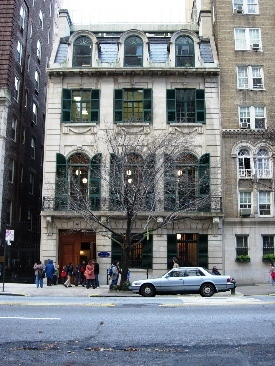 Using a $2.5 million gift from Edgar M. Bronfman, New York University purchased the house in 1994 for use as the Edgar M. Bronfman Center for Jewish Student Life. A three-year restoration of both the interior and exterior was initiated by Helpern Associates. Today the De Forest House remains the attention-grabber that it was over a century ago. The teakwood carvings are still crisp; having withstood the severity of New York City weather better than the eroding brownstone buildings around it. The end of the Civil War brought an immediate boost to New York businesses. Over 35,000 miles of new railroad track was laid within only a few years and reconstruction of the South meant an inflow of cash to Northern merchants. In 1866 the Metropolitan Savings Bank decided to build a new, magnificent bank building. The board chose architect Carl Pfeiffer to design the structure. Pfeiffer, who arrived in the United States at the age of 16, had spent his time in the West; only arriving in New York two years before this commission. With the vivid lesson of New York’s great fire of 1835 that destroyed most of the building in southern Manhattan and considering the valuable cash and paper bonds and documents that would be housed inside, Pfeiffer convinced the board that a fireproof structure was advisable. The architect chose the latest architectural trend coming out of Paris for his new building – French Second Empire. He designed a stately four-story white marble building over a raised basement. Deep quoins at the corners drew the eye upward to the graceful slate mansard roof. Here a series of robust, arched dormers sat primly along the cornice. A steep set of stone stairs rose from the Bowery sidewalk to the rusticated, arched entranceway. The floors not used by the bank were leased out and, mostly due to the well-publicized fireproof construction of the building; they were filled almost immediately resulting in the building paying for itself. 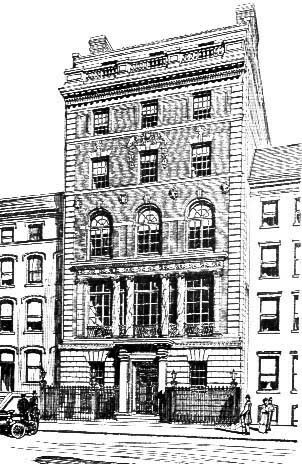 The Stuyvesant Safe Deposit Company took a ten year lease on the basement and sub-basement. The second floor was rented by the United States Assessor of Internal Revenue. The Metropolitan Savings Bank remained here until 1935 when it moved to its new offices at 754 Broadway. The wonderful white marble building sat empty until 1937 when it was sold to the First Ukrainian Evangelical Pentecostal Church. Now known as the First Ukrainian Assembly of God, the church remains in Carl Pfeiffer’s innovative and beautiful building. The Bowery stoop has been removed but otherwise little has changed. In examining the building in 1976 the National Register of Historic Places remarked “The interior of the Metropolitan Savings Bank Building remains remarkably intact, retaining most of its original fabric.” The original paneled doors, wainscoting and moldings are all in place. The little half house at No. 35 West 12th is vised between two large apartment buildings. Along the quiet block just off 5th Avenue in 1840 a comfortable brick residence was built at No. 35. West 12th Street. By now the Federal style of architecture was melding with the proportions of the wider Greek Revival style –this house being a roomy 25-feet wide. A brownstone stoop rose to the parlor floor over a deep brick English basement. Within a decade grand Victorian homes were being built as 5th Avenue mansions crept northward from Washington Square. By the time Francis Deery was living here in 1862 the house was out of style. After the end of the Civil War the owners of No. 35 gave their home a makeover. In 1868 the house was brought up to date with a fish-scale mansard roof with two arched dormers above a vigorous cornice supported by scrolled brackets. The Second Empire mansard gave the home a full third story, replacing the half-story dormered attic. The owners now had a residence on a par with the new houses on the block. Then in 1893 the homes to the east at Nos. 33 and 31 were razed for the construction of a mammoth stone apartment building. But the two plots were not wide enough for the project and the developers purchased half of the lot on which No. 35 sat. One half of the handsome house was demolished and the remainder was renovated to accommodate life in 50 percent of the former floor space. What resulted was a quaint, storybook house of miniature proportions. Here in the 1930s lived the lyric soprano of the Metropolitan Opera, Minnie Egener, her husband Louis Hasselmans who was the conductor of French opera at the Met, and their daughter Geraldine. The diva died in the house on January 15, 1933. In the last half of the 20th century a modern apartment building was built on the west side of No. 35. The skinny appearance of the house was suddenly intensified as it became squashed between the two goliaths. No. 35 West 12th Street is one of New York's delightful architectural oddities that keep urban explorers intrigued. The committee chose the designs of McKim, Mead & White and they got what they asked for. Borrowing loosely from the design of the Bank of England in London, the architects also drew inspiration from the monumental white marble edifices that graced Chicago’s World’s Columbian Exposition of a year earlier. 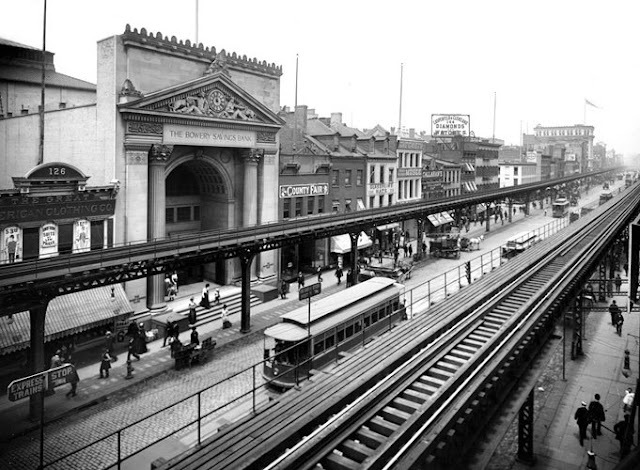 The firm created a Roman temple to banking that wrapped around the existing building at Bowery and Grand Street. 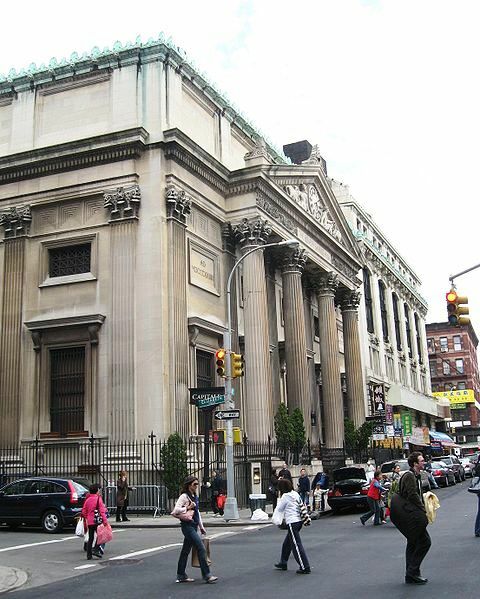 The L-shaped structure had a majestic two-story portico on Grand Street with four colossal Corinthian columns supporting a classical pediment. Frederick MacMonnies sculpted two reclining figures representing Time with an hour glass and scythe, and Industry that rested against an enormous clock within the pediment. 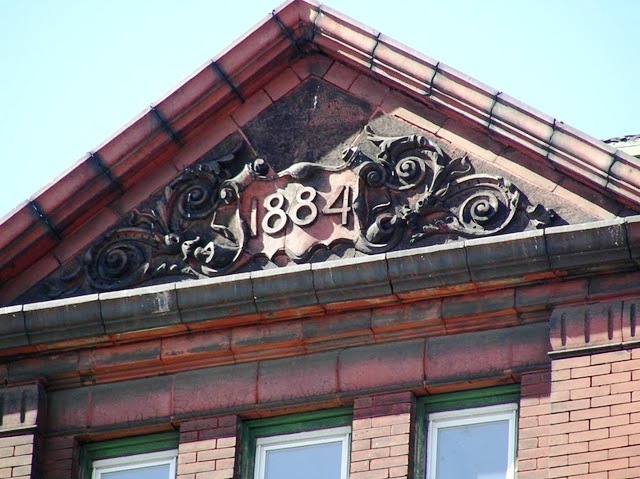 The narrower Bowery façade was entered through a deep, coffered triumphal arch flanked by fluted columns matching those on the Grand Street side and capped by an identical pediment. Like other new bank buildings following the Financial Panic of 1893, the building was intended to instill confidence in those who would entrust their savings here. The classical, sturdy limestone structure exuded the strength and stability that wary investors found reassuring. A 100-foot, mosaic-floored corridor led from the Bowery entrance to the main banking area which sat beneath an enormous amber glass dome. Corinthian faux-marble columns with gilded capitals supported the dome and matching marble pilasters rose between the windows. Beneath the dome was the 8-foot tall cashier’s counter crafted of Sienna marble and bronze grills. White mahogany trim and glazed brick walls finished off the interior design, under a rich coffered ceiling based o the Basilica of Constantine in Rome. Construction was completed in 1895 at a total cost of $570,421.57. The Bowery Savings Bank remained in its imposing Roman temple until 1982 when it was sold to H. F. Ahmanson & Co., who renamed it Home Savings of America. In October 2002 it ceased to be a bank and the building opened as Capitale – a banquet and events venue. 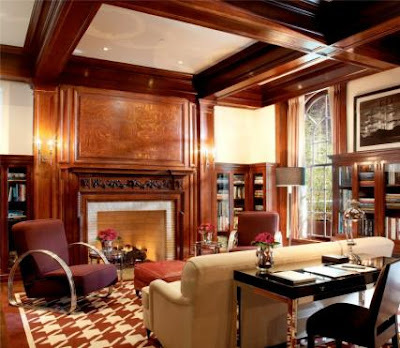 Owner Stan Greenberg spent $4 million to restore and convert the36,000 foot space. 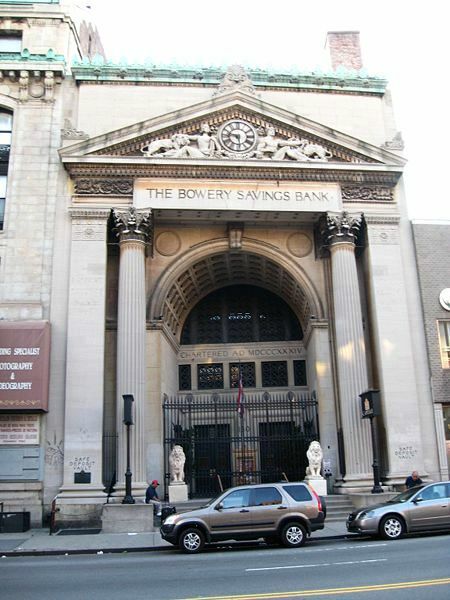 The Bowery Savings Bank exterior was designed a New York City landmark in 1966 and the breathtaking interiors were landmarked in 1994. The Bowery in 1884 was a mixed bag. 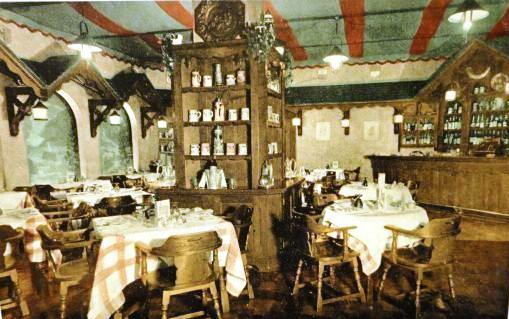 As the recreation area for Little Germany, it teemed with German beer halls and music halls. There were impressive bank buildings and respectable retail stores during the daylight hours. But it was also home to “disorderly houses” – the polite term for brothels – and saloons. Shady characters and sailors loitered in doorways after nightfall. In an effort to salvage the souls of young men adrift in this sea of vice, the Y.M.C.A. 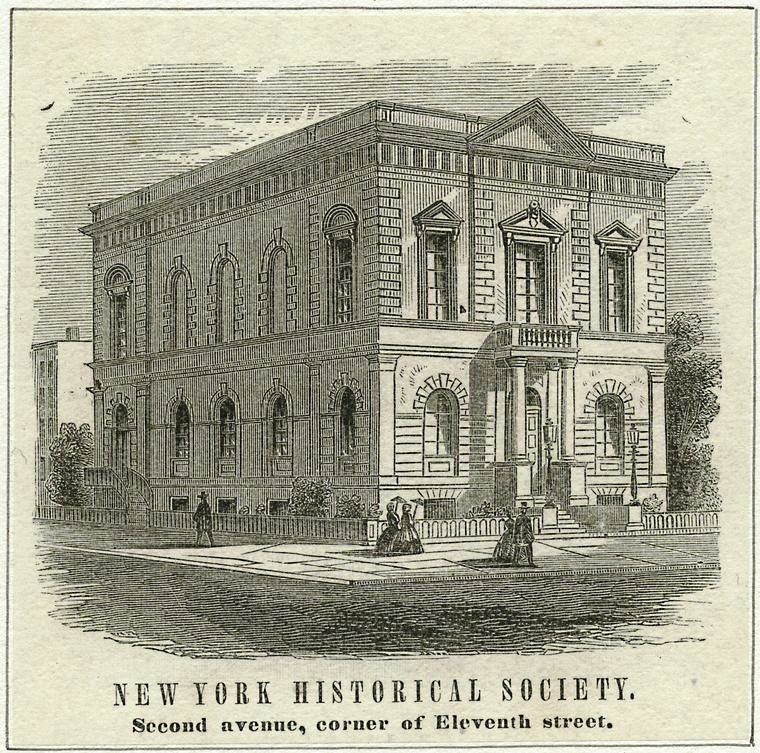 established the Young Men’s Institute at 222 Bowery. The association was intended to afford "opportunities for physical and mental development, social recreation, and special industrial instruction to young men of moderate means,” as reported by The New York Times. Visitors entered a large reception room with a large fireplace and built-in “chimney corner seats.” Here were newspapers, writing tables and upholstered chairs and settees. The walls were of no-nonsense plaster with wood trim. Also on the first floor was the gymnasium “furnished with all the requirements of a good physical training place, including plenty of pulling and rowing weights, dumb bells, Indian clubs, climbing ropes, inclined and horizontal ladders, spring board, striking bag, two horizontal bars, two pair of parallel bars, and several substantial mats to prevent bruises from falls,” according to The Times. A locker room with tub baths and showers adjoined the gym, as well as two bowling alleys. The second floor contained the wood-paneled library, outfitted initially with 800 books which the boys were allowed to take home, and a 500-seat auditorium. Above were the classrooms where classes in penmanship, free hand, architectural and mechanical drawing, bookkeeping and “the trades” were taught. Concerts, lectures and readings were offered in the auditorium and activities (which smack of today’s after-school programs) were organized including a glee club, an orchestra and a debating club. The facilities were open to young men “of good character” between 17 and 35 years old who could pay the dues. A year’s membership cost $4 and a gymnasium membership was another $3. Classes cost 50 cents per term. A year after the building opened, fire broke out in the Brush Electric Illuminating Company at 204-210 Elizabeth Street. The grease-soaked floors and supplies of stored paraffin resulted in a major conflagration which threatened the Institute. When the young men realized the danger and began to panic, Superintendent C. H. Sage rallied them into a fire-fighting brigade. By the time they reached the auditorium the lead in the stained glass windows was beginning to melt and the windows, bit by bit, fell apart. Using “the standing fire extinguishing apparatus”, the boys fought the flames that burst through the destroyed windows, setting fire to the furniture. When Engine Company No. 9 finally responded, they vented the roof by smashing the stained glass skylight in the dome. When it was over the young men had saved the building, which sustained $22,000 in damages; however the once-beautiful art glass windows and dome were gone. In January 1889 the Institute had 650 members and a daily attendance of about 280 boys, with another 348 young men attending classes. By now the number of courses offered had increased to include carriage drafting, steam engineering, vocal music, physiology and first aid. A year later 13,065 young men attended the 37 free entertainments. The first year a piano was hoisted up to the roof garden to supply music to the boys; however after a short time in the weather it was just an empty hull. Times had changed by the Great Depression years and in 1932 the Bowery was the seedy, last stop for alcoholics, the homeless and others down on their luck. The Y.M.C.A. left the building, which became home to small manufacturers and loft space. The story of the red brick building should have become uninteresting at this point. But as the Nazis stormed into Paris, Cubist and non-figurative abstract artist Fernand Leger escaped to New York where he took up residence in a part of No. 222 until his return to France in 1945. Before long muralist and abstract painter James Brooks moved in. Then artist Wynn Chamberlain. In 1959 abstract painter Mark Rothko took over the old gymnasium to work on his murals. That space was passed on to Abstract Expressionist painter Michael Goldberg in 1962. Burroughs moved in. And Gysin, whom New York Magazine called “the artist’s artist among the Beats.” Gysin’s lover, artist and poet John Giorno, lived there as did artist Lynda Benglis. William Burroughs called his apartment “the bunker” and tagged the door buzzer with that name rather than his own. Others who came and went, visiting the artists and poets, were Allen Ginsberg, Keith Haring, Jean-Michel Basquiat and Blondie. In 1997 Burroughs died and Giorni, who still lives at 222 has preserved “the bunker” exactly as he left it. The times are changing once again for the Bowery, however. The first floor of No. 222 is home to Green Depot an eco-friendly housewares store. Little by little the apartments are being leased at market rates and the vestiges of the Beat Generation are flaking away. The red brick building, however, holds an important place in 20th Century art and literary hisory. In 1804 the United States was only 28 years old. New York City, on the other hand, was 190 years old. Accordingly John Pintard, the secretary of the American Academy of Fine Arts, conceived of an institution dedicated to the history of the city that included a library, lecture hall and museum of artifacts. The most prominent citizens of the city joined in the effort and within a few years the New York Historical Society boasted a collection of thousands of books, along with oil portraits, engravings, maps, almanacs and historical documents. The Society bounced around different venues for nearly half a century, finally using rooms provided by New York University until its collections grew so large it required a building of its own. 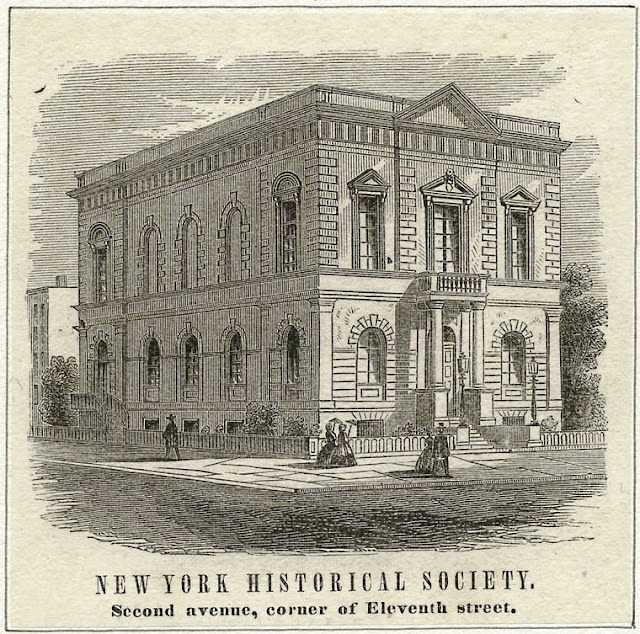 On December 7, 1853, members agreed on a plot of land at the corner of 2nd Avenue and 11th Street, in one of the most fashionable residential areas of the city. Wealthy neighbors had donated $5000, just under half of the price, towards the purchase of the lot provided it be used for the erection of the Society building. An advertisement for the submission of architectural plans had already been placed and designs were being received. Other locations that had been considered but which were turned down were the triangular plot at Broadway and Fifth Avenue where the Flatiron Building would later rise and the southwest corner of Broadway and 20th Street upon which Lord & Taylor’s grand emporium would be built. The 2nd Avenue site, however, in 1853 was choice. Across the street was St. Mark’s Church and the mansions of the city’s leading families like Stuyvesant, Rutherford, Fish, Livingston and Chanler surrounded it. 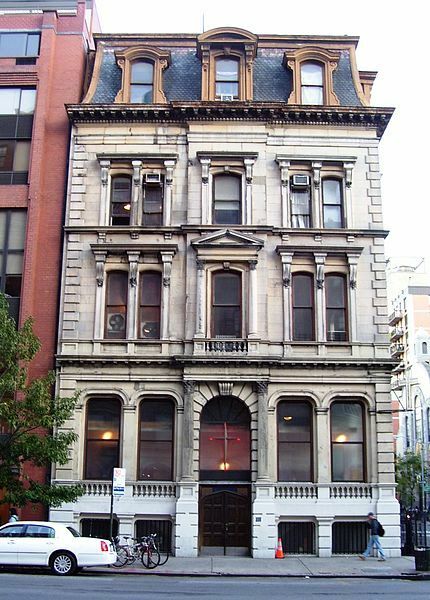 Architects Mettam & Burke had won the commission for their two-story Italianate stone building. With the memories of the Great Fire that had destroyed most of downtown New York only two decades earlier, the building was intended to be fire-proof. Cast iron staircases, hollow walls and iron beams were used. “Then the boldness of the Society in venturing upon the construction of a fire-proof building, and carrying it so rapidly to a point from which completion will be an easy job, certainly belongs to this and no past age,” said The New York Times a year later on October 9, 1856. The “easy job” of completing the structure seemed less so as the years dragged by. The new building was not finished for nearly three years; but it was worth the wait. Dedicated on November 3, 1857, the $85,000 building was completely paid for when the doors opened. A tall porch with Doric columns sheltered the entranceway and formed a handsome balcony above. A stone balustrade fence enclosed the grassy yard and cast iron gas lamps illuminated either side of the approaching walkway. The first floor housed a 50-foot by 65-foot lecture room capable of seating 600 persons. Upstairs was the Library and Art Gallery under a great 47-foot high glass dome that flooded the space with light. “The proportions are good; the alcoves and shelves are durable and elegant; the decorations in white and gold are chaste and pretty,” said The Times. The refined exterior easily slipped into the residential nature of the neighborhood by not appearing “commercial.” At the dedication ceremony (which was also the 53rd anniversary of the Society’s founding) Benjamin R. Winthrop presented the “Washington chair,” made from wood used in the house at Pearl and Cherry Streets which was the first home of George Washington after his inauguration. As donors gave their art collections, the museum area of the Society became more and more eclectic. Finally the members decide to hone the collections to only those items that were specific to New York City history. Many of the museum’s collection of paintings and art became the basis of the Metropolitan Museum of Art in the 1860s. With the 20th century came change to the once fashionable area around the Historical Society building. As mansions were razed for commercial loft buildings, the Society building was surrounded by a congested manufacturing district. A move uptown was deemed necessary. In 1908 York & Sawyer designed a solemn Beaux-Arts building on the west side of Central Park and the New York Historical Society moved out of the dignified building that had housed its lectures and exhibitions for nearly 60 years. 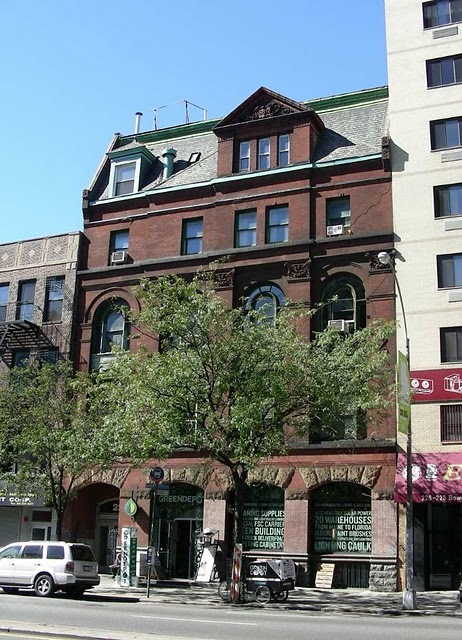 The building sat empty until being sold in 1912 to be converted into a newsboys’ club. The main hall was turned into a gymnasium. Within a few decades the stone Italian structure was gone, replaced by a non-descript brick apartment house. Quiet West 10th Street, between 5th and 6th Avenues was lined with handsome brick Federal homes throughout the 1830s and ‘40s. As the 1850s approached, Victorian homes -- wider, taller and more impressive-- began replacing existing structures. Just after the Civil War, in 1871, Mrs. Sarah Charlotte Clarke owned the little house which was decidedly out of fashion, architecturally. The socialite and dressmaker commissioned architect Daniell Tyrrell to renovate the out-of-date home. Stylish, paneled double entrance doors were added, the parlor floor windows were extended, the delicate Federal ironwork was replaced with heavier, more robust Victorian railings and a bracketed cornice was installed. Most impressive, a fashionable mansard roof was added, bringing the structure up-to-the-minute in taste. Later, in the last quarter of the century, the lintel over the doorway was replaced with a modern late Victorian design. Prior to 1880 Sarah Clarke moved two doors down to No. 52 and in 1880 Dr. Eben M. Flagg lived here with his wife Minnie. The doctor ran his practice from the first floor; the parlor used as the waiting room. It was the scene of an unfortunate incident when Mrs. Aimee Howard arrived to have a dental procedure performed. She brought with her an expensive umbrella with a carved, ebony handle. After five hours in the dentist chair, Mrs. Howard prepared to leave, only to find her umbrella was gone. Minnie Eban casually explained that her friend, Mrs. Stewart had taken it because it had begun raining while she visited to bring Mrs. Eban tickets to the bal de l’opera. She provided Mrs. Howard a spare umbrella. A week later, when Mrs. Howard returned to pay her bill, she inquired about her umbrella. “Oh, it’s been stolen,” lamented the dentist’s wife. Mrs. Howard commenced legal proceedings and the press became involved. All parties appeared in court while, in the meantime, Mrs. Flagg penned an advertisement offering a $10 reward. Mysteriously, on March 13, a boy knocked on the door of No. 48 around 6:00 in the evening delivering a parcel that “a man had just given him.” The boy said the man had given him 25 cents and directions to deliver the umbrella to Dr. Flagg. The case was dropped. And Dr. Flagg undoubtedly lost a patient. In 1887 it had become an annoyance to Sarah Charlotte Clarke who lived on the opposite side. “She says that it is full of rats and cockroaches all the year round and that in Summer flies by the trillion breed there; that foul stenches are generated there and fast men congregate there,” reported The New York Times. Worse, Mrs. Clarke admitted, were the fast men who sat around the sidewalk smoking cigars and “do not confine their wickedness to the stable.” She complained that they flirt with the servants and even “make eyes” at her. She sued Moses Devoe for $15,000 for the injuries the stable had done to her. In 1901 the house was home to Japanese landscape painter Kikishi Yama, perhaps the sole Japanese landscape artist in the country who worked in oils. Mr. Yama maintained his studio across the street at No. 51, according to The New York Tribune. By 1927 Romeyn Park Benjamin, the brother-in-law of Enrico Caruso was living here. He died in the house, aged 46, on December 7, 1939. Perhaps no period in the long history of the house is more intriguing than when Marguerite Pumpelly Smyth lived here. A follower of the Eastern guru ‘Abdu’l-Baha, Marguerite (who called herself Daisy) had many long-term guests who were also involved in the spiritual movement. The house was a famous meeting place for people of all races and religions and “fireside meetings” were nearly constant. Upon entering the door, one often heard the guru’s voice in a spontaneous chant he had recorded in 1912. ‘Abdu’l-Baha personally blessed each room of the house. Juliet Thompson, a cult figure of the movement, moved in. She would often entertain the author Kahlil Gibran who lived at No. 51 West 10th where Kikishi Yama had had his studio. The author would invite Thompson to his studio where he would read aloud the last chapter of whatever book he was writing. By the late 1940s Daisy Smythe, Juliet Thompson and the colorful troupe of spiritual residents had moved on. Dr. Dimitri Marianoff , the son-in-law of Albert Einstein, was here in 1950 and by 1954 it was the home of Frank M. Didisheim and his wife, who annually turned the small rear garden into a free, modern sculpture exhibition for about a week at a time. Divided into apartments, one family per floor, in 1962, No. 48 West 10th Street is a remarkable house with an equally remarkable past. 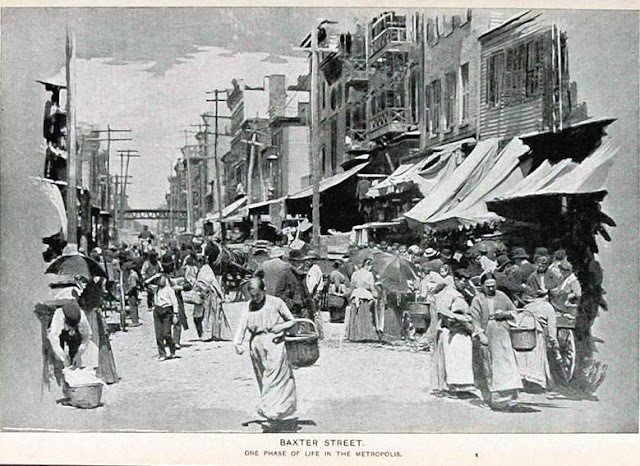 As the first half of the 19th Century drew to a close, Italian immigrants seeking new opportunities in America began settling in the Lower East Side of Manhattan. Gradually, tens of thousands would come together forming what would be known as Little Italy. Those new opportunities, however, proved more difficult to seize and families were crammed into dismal and often unsanitary tenement houses. Italian immigrants, shunned by established New Yorkers, were not permitted to worship in church sanctuaries, but were relegated to make-shift areas in the basements. In response, the Vatican issued a decree in 1888 to establish a parish for the needs of Italians. A group of Scalabrini Fathers were given the task of founding the Most Precious Blood National Parish. Three years later the Fathers, of the St. Charles Borromeo Society, had purchased land at 113 Baxter Street and commenced construction of the church. Architects William Schickel & Company were given the commission for the design. 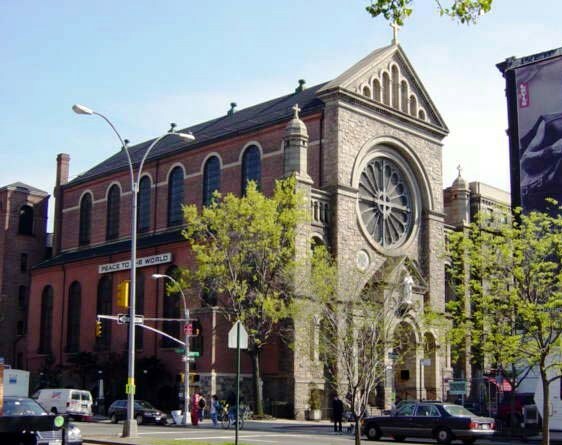 Bavarian-born William Schickel worked in partnership with Isaac E. Ditmars and Hugo Kafka and, beginning with the Church of St. Vincent Ferrer in 1879, was responsible for many buildings for the New York Diocese. Shickel’s German background was reflected in the facades of many of these structures. By the time the basement level was somewhat completed, however, the Fathers realized they were in over their heads. With a debt on the property of about $100,000, the Archbishop approached the Provincial Minister of the Franciscans in 1894 . The friars took over the parish and the construction. In the meantime, the basement level was roofed over and services were held below ground while the necessary funds were amassed. Realizing that Saint Januarius (or San Gennaro) was important to the parishioners, many of whom were from Naples, the friars supplied the church with a relic of the saint’s 1,700-year-old dried blood. Meanwhile, the neighborhood of the parish was crime-ridden and dangerous. The Five Points area, just south of Baxter Street, was notorious for “disorderly houses,” crime and gang activities. James D. McCabe, Jr., in his 1882 "New York by Gaslight" noted "Baxter street is another scene of misery, and, alas, of crime...It is a terrible neighborhood, and at night even the police venture into it with caution. Drunken rows, fights, and stabbing affrays are of nightly occurrence." In July of 1898 Father Buonaventura Piscopo had had enough. The priest visited the landlords who rented rooms to “disorderly ladies” and threatened to make their names public if they did not stop the practice. The landlords knew that respectable tenants would then leave. 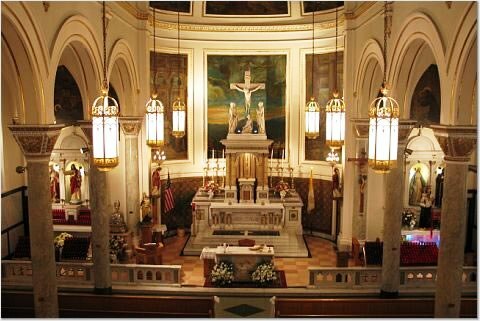 At the time the Church of the Most Precious Blood was baptizing around 2,000 Italian babies every year and there were about ten weddings every Sunday. With his growing flock, Father Piscopo was serious about stamping out the immoral atmosphere in his parish. Indeed, that was a problem. The day before Father Piscopo revealed his death threat from the pulpit, Angelo Gabrieto had gone to the home of his former companion, Carmella Lamaa, who was now living with Antonio Corruso. After harsh words, Carmella urged her new boyfriend to attack Gabrieto with a hatchet. Gabrieto produced a knife. Both men died. Finally, although the debt had been reduced only to $65,000, construction of the upper church began. On July 7, 1901 Archbishop Corrigan laid the cornerstone which contained U.S. and Italian coins, the names of the Archbishop, other clergymen and President William McKinley, and other documents. Temperament of the neighborhood, unfortunately, was unchanged by the impressive new structure. One month after the dedication, as Father Bernardino Politz emerged from the confessional early in the evening, he was approached by 40-year old Giacomo Gerolmini who explained his niece, Camilla, had married Cavallero Ruggiero in a civil service a few days before. He asked the priest to arrange a church ceremony. The groom was present along with several of his family members. With that the uncle pulled out a pistol and shot the young groom in front of the altar, emptying the church of worshippers. Ruggiero recovered and the pair was later married in the church ceremony. By the late 20th Century the building was suffering from water leakage and general disrepair. A complete two-year renovation was initiated in 1995. Frescos and oil paintings inside were restored, the building cleaned and the exterior cleaned and repaired. Today the Little Italy neighborhood has shrunken as, over the decades, second and third generation Italian Americans have moved away. Chinatown slowly encroaches on its borders, yet Italian restaurants, stores and social clubs still abound. Here every summer the Church of the Most Precious Blood sponsors the Feast of San Gennaro. Originally a solemn holy day to remember the parish’s Patron Saint, it is now a week-long street festival, reportedly the largest religious festival in the country. The block of West 10th Street between 5th and 6th Avenue is a time-line of architectural styles. Federal residences are interspersed among mid-Victorian row houses and early 20th Century apartment buildings. The end result is a fascinating and charming residential enclave. Among the stand-outs is No. 56, an orange brick Federal home built in 1832 when Greenwich Village had just started developing from a sleepy rural community to a fashionable neighborhood. As New Yorkers fled the congestion and cholera of downtown, they built scores of similar homes in the tiny village of Greenwich. Built for a well-to-do merchant-class family, the builder added special touches to enhance its simple lines and understated dignity. The wrought iron fencing protecting the English basement was capped with stylish palmettes and the elegant doorway was flanked with fluted Ionic columns and lacy leaded side lights. It was the wrought iron basket newel posts, however, that were intended to proclaim the status of the family. Perched on brownstone pedestals, the expensive ornate newels posts were capped with stylized iron pineapples – the symbol of welcome since early sailing days when returning ship captains would skewer a pineapple onto the fence post, signaling that he was home and receiving visitors. The ornate basket newels are topped by pineapple finials -- a symbol of welcome. Two high, arched dormers raised the attic height where servant girls would sleep. Around the time of the Civil War the house was updated with a new cornice with ornate scrolled brackets, but otherwise the house remained as originally designed even as wealthy Victorians built wide, fashionable homes in the latest style just down the block. The attractive home caught the eye of Oscar L. Spitzer in April of 1890. The family of Mary Bachman was living there when Spitzer knocked on the door and explained that the Fire Department was looking for land in the neighborhood for a new engine house. He lamented to the family of his unsuccessful search for a site so far, however he was very much impressed with West 10th Street as a location for the new firehouse. He visited the family again a few days later, hinting at the possibility of a fire house being built next door or nearby. Mary Bachman, in the meantime, had discussed the matter with her lawyer only to find out the Fire Department had no intentions of building a new house. By the turn of the century, John Alvin Young, president of the Windsor Trust Company was living at No. 56. He sold the house in December 1906 to Malvina Appleton when he moved his family to Long Island. A year later, in August, Malvina rented the home for the winter to newlywed socialites Mr. and Mrs. Outerbridge Horsey. Horsey was a noted lawyer and his wife was the daughter of the socially-prominent Washington DC widow, Mrs. Charles Carroll Lee. In the years during World War I and immediately thereafter, the bohemian charm of Greenwich Village drew artists and musicians. In 1923 architect Howard Major was commissioned to add a “private art studio” in the English basement. Still a private residence, No. 56 West 10th Street is a remarkable state of preservation. Its ironwork is pristine, its architectural detailing intact. It is a stand-out on a street of remarkable buildings. High brow Victorians viewed those in the theatrical profession as slightly beneath them. As elite gentlemen’s clubs sprouted around the city in after the Civil War, a group of actors and musicians formed their own club, The Lambs. 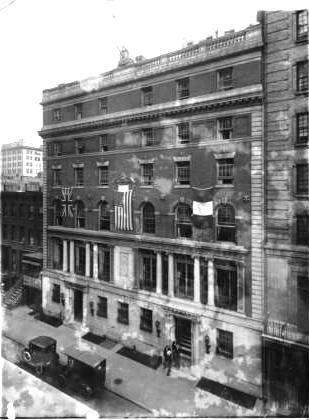 In 1897 the club moved into its first permanent home at 70 West 36th Street; however within a matter of years it outgrew the facility. 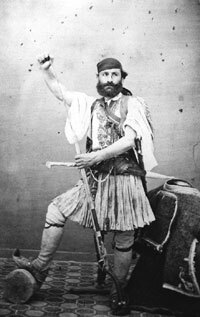 Members would regularly stage both private and public productions called Gambols (satiric revues). These eventually led to the need for their own, private theatre when contention arose among members over the use of certain public venues. The club approached architects McKim, Mead and White – all of whom were members – to design the new clubhouse. Lots were purchased at Nos. 128 and 130 West 44th Street, near the Broadway theatre district, for the new structure. Stanford White headed up the design – a brick and marble Georgian building with terra-cotta embellishment completed in 1905. A marble street-level base supports an impressive second story of high French windows and paired Ionic columns. Between the arched windows of the third floor, lambs’ heads peer down from the Flemish-bond brickwork. The first floor housed the lobby with its row of telephones, a billiard room and a grill room. 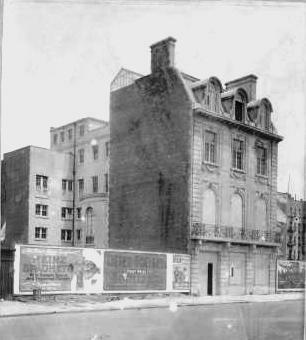 The banquet hall faced 44th Street behind the large second floor windows. The Lambs’ private theatre was installed on the third floor, while above were offices and sleeping rooms for the members. Ten years later the building was doubled in size by architect George A. Freeman who added a mirror-image addition. The atmosphere of the club was distinctly different than that of other gentlemen’s clubs. “While many of the clubhouses of the Big Town display constantly the dignity and spirit of Greenwood Cemetery on a rainy Saturday afternoon, the Lambs is as full of snap and ginger as an outlaw bronco, a bunch of freshly lighted firecrackers, or a schoolboy the first day of vacation,” quipped The Times in 1914. 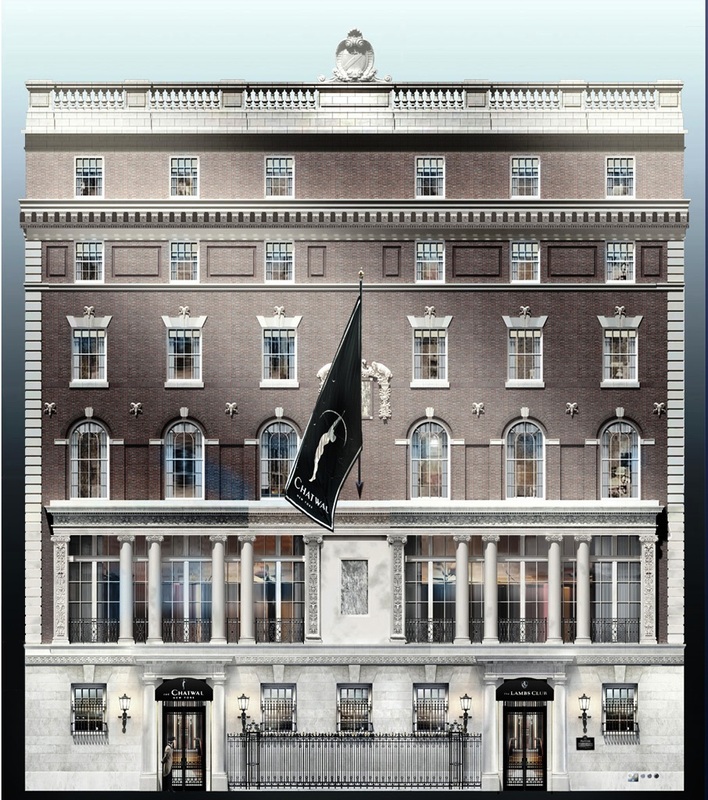 Indeed, the halls and rooms were home over the years to such members as the Barrymores (except Ethel), Irving Berlin, Cecil B. DeMille, David Belasco, Charlie Chaplin, Douglas Fairbanks, Ridgard Rodgers and Oscar Hammerstein II, Fred Astaire, George M. Cohan, Spencer Tracy and thousands of others. The actress then walked out, leaving the group of Lambs dumbstruck. Problems came in 1974 when the club was in danger of losing the building to a $350,000 mortgage. In December a fund-raising gala was held to try to stave off receivership. It was all too late. Thirty years later Indian-born businessman Sant Singh Chatwal purchased the building, converting it to the Chatwal Hotel. After a renovation that took several years, the hotel opened in 2010. 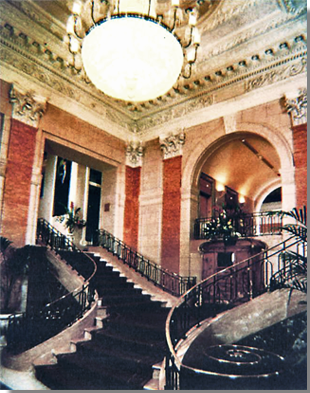 Stanford White’s turn-of-the-century interiors were, for the most part, gutted and replaced by sleek neo-Art Deco spaces. The exterior of the former Lambs Club was designated a New York City landmark in 1974. The first shovels of earth removed in 1901 for the foundation of John Jacob Astor’s St. Regis Hotel at the southeast corner of 5th Avenue and 55th Street signaled the beginning of the end of the area as Millionaires’ Row. A year later Fifty-Fifth Street Company purchased and demolished the mansions across the avenue at the southwest corner to begin construction of an elegant family hotel, the Gotham. The group commissioned Hiss & Weekes to design the structure which would abut McKim, Mead & White’s Italian Renaissance University Club to the south, completed a few years earlier. As is the case now, architects of the time tended to treat each commission as a stand-alone project; ignoring the possibility of sympathetic treatment of surrounding structures. Hiss & Weekes felt otherwise. The rising limestone hotel would be more restrained than its extravagant Beaux-Arts neighbor across the avenue; however for the entranceway the architects pulled out all the stops. The doorway gushes with elaborate sculptural ornamentation. It is capped by a broken pediment surmounted by the reclining figures of Ceres and Diana on either side of a bull’s-eye window. On either side are two double-story banded Doric pillars. Family hotels were intended for well-to-do New Yorkers who no longer wanted the trouble of maintaining a private home, and for out-of-towners who spent considerable time in the city and needed to retain a second residence. By October 2, 1905 the hotel was ready for occupation. There were 400 sleeping rooms, both single and en suite, and by opening day all the rooms with a Fifth Avenue frontage were taken. A banquet hall and ballroom were on the second floor, while the third floor was dedicated to private dining rooms. The wealthy and well-known began moving in immediately. Mrs. M. A. Hanna, widow of Senator Hanna, was the first resident, following closely by Senator T. C. Platt’s family. There was, however, a problem. 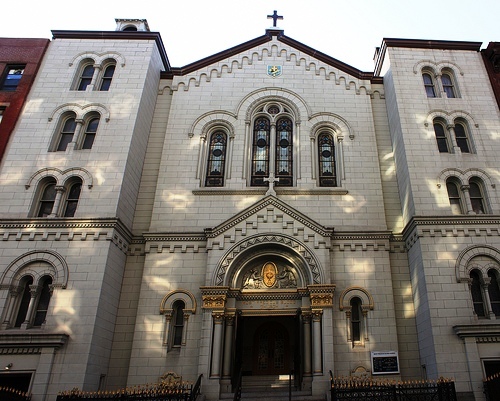 The Gotham sat directly across 55th Street from the 5th Avenue Presbyterian Church, well within the limits that prohibited the sale of liquor in the hotel. After continued legal battles ending in failure, the hotel shrugged off the snag. And, in fact, the hotel hired young boys fitted out with wicker baskets or milliners’ boxes, whose duties were to rush to a supply base a block from the hotel and fill guests’ orders for wine or liquor. Since the guests’ money was turned over to the off-site vendor and not the hotel, the liquor law was circumvented (although the hotel protested that “There is no attempt to evade the law.”). Despite the clever ploy, the hurdles to getting a drink at the Gotham contributed to its foreclosure within three years of opening. In October 1908 it was put on auction, the mortgage under foreclosure being $500,000 with prior liens amounting to $2 million. The hotel, which cost about $2 million to build and between $1 and $2 million more to furnish sold for $2.45 million to Benjamin P. Cheney, President of the Hotel Holding Company. Cheney immediately made changes. While the long-term residents stayed on, he focused more on traveling guests. And despite the troubles in its short past, the hotel still lured New York’s elite. In the grand Louis XV ballroom on December 22, 1909 Mrs. Richard Stevens hosted her Christmas dinner for 60 guests, after which more arrived for dancing and a midnight buffet supper. Among Mrs. Stevens’ guests were Mrs. William K. Vanderbilt, Mr. and Mrs. Robert Goelet, Mr. and Mrs. Charles Dana Gibson, The Marquis de Beauvoir, Prince Troubetskol and Mrs. And Mrs. Clarence Mackay. Mr. and Mrs. George Bird, who had lived in the Gotham for 12 years, were shocked when they returned to their suite of rooms on January 17, 1918 to find that $25,000 worth of jewelry had been stolen in their maid’s absence. It was a rare tarnish on the Gotham’s sterling reputation. In 1920 the newly refurbished and redecorated hotel was sold once again, this time to Julius and William Manges for $4 million. The Manges Brothers were on a buying frenzy of Manhattan hotels – having just purchased the Hotel Cumberland, and already owning the Netherland, the Endicott, the Martha Washington, the Great Northern and the Grand. 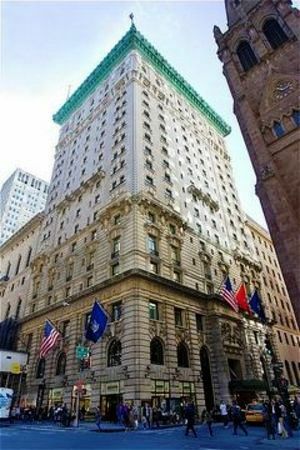 The Great Depression delivered a crushing blow to the owners and in 1932 the hotel was once again in receivership in a $2 million foreclosure action by the Metropolitan Life Insurance Company. Within a few years apartments were being offered, each with “serving pantry and electric refrigeration.” By 1938 the street-side restaurant was closed and five stores were opened up on the ground floor facing 5th Avenue. The hotel was sold and resold until, in 1979, it was taken over by Rene Hatt who initiated a nearly-ten year, $200 million renovation. 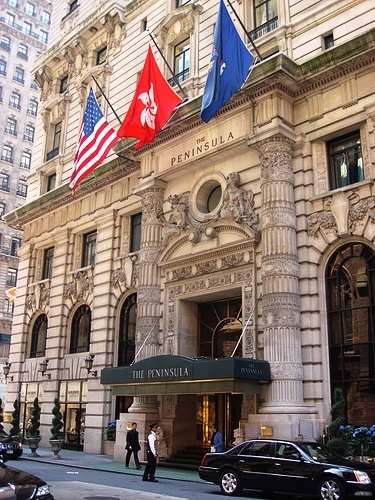 It was purchased by the Peninsula Group in 1988 which, ten years later, closed it again for a $45 million overhaul. 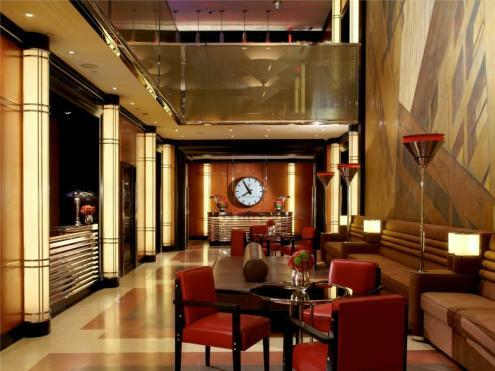 The grand Gotham Hotel stands proudly once again after a century of sometimes tumultuous times. Although Ogden Codman, Jr. was born in Boston to a prestigious family, he grew up in Paris. Upon his return to the States, he decorated the mansions of New York’s old guard, refusing commissions from the nouveau riche, and wrote the widely-read "Decoration of Houses" in partnership with Edith Wharton. Codman’s Parisian background left deep impressions on him and when he began designing houses as well as decorating them, his love for all things French was obvious. In 1907 he purchased the lot at 7 East 96th Street, still several blocks north of the area where the main thrust of mansion building was going on. While they were still contemplating their new home, Codman’s wife of only six years died in 1910. Now alone, Codman set about designing the elegant residence his wife would never share. Ogden Codman lived in his grand home with six servants and his chauffeur until 1920 when he left for his beloved Paris. In December of that year he negotiated a lease by cable to rent the house furnished to George Edward Kent. Kent paid an annual rent of $25,000. The following year Ronald Tree, cousin of Marshall Field III, and his decorator wife who professional was known as Nancy Lancaster, moved in. By 1924 the family of E. Oliver Iselin owned the house. Iselin was a dynamic force in the New York Yacht Club and the America’s Cup races. The family also had a summer cottage in Saratoga, a winter home in Aiken, South Carolina, an estate in Upper Brookville, Long Island called Wolver Hollow, and a race horse farm in Mount Vernon, New York. Here on January 10, 1925, Mrs. Iselin, who was the daughter of millionaire William Goddard, hosted a glittering dance after a dinner at Sherry’s in honor of their debutante daughter, Edith Hope Iselin, and their niece, Dorothy Iselin. Following the Iselin family in the house were William Scoville Moore and his wife the former Edith Pulitzer, daughter of millionaire publisher Joseph Pulitzer. The Moores purchased the house in 1927. Although William and Edith Moore would retain possession of the property until 1948, they apparently spent little time here; instead leasing it to other moneyed New Yorkers. By 1932 attorney James Randall Creel was living here when he secretly married Alexandra Diodati Gardiner in the Cathedral of the Incarnation in Garden City, Long Island. Hearing of the elopement, the bride’s mother, Mrs. Robert Alexander Gardiner, rushed to the church to stop the ceremony. “Mrs. Robert Alexander Gardiner, Park Avenue society matron, forwarded by registered mail to the Long Island diocese of the Episcopal church charges against the Very Rev. G. T. P. Sargent, dean of the Cathedral of the Incarnation at Garden City, who, on Friday night last, officiated at the wedding of her daughter,” reported The New York Times on June 13, 1932. Another lawyer, Richard Allen Knight, and his wife moved in after the Creels moved on. Knight had been a respected attorney until he was unsuccessful in litigation connected to the $14 million estate of his father-in-law, Lewis Cass Ledyard, Jr. The incident unnerved him and he sent a string of harassing letters to many prominent lawyers and a judge. Knight pled guilty in July 1942, was disbarred and sentenced to three months in the workhouse. In the meantime Dorothy Ledyard Knight filed for divorce, charging cruelty. Not long afterward William and Edith Moore sold the mansion. For several years the Nippon Club was headquartered here, its Japanese Flower Show being an annually-anticipated event. The Manhattan Country School purchased the house in 1965. In 2000 a restoration of the façade, including slate roof and copper dormer replacement, and masonry cleaning was completed. The interiors remain almost perfectly intact. The little slice of Paris created by Ogden Codman, Jr. looks much today as it did when he moved in nearly a century ago. Tall windows replace the original doorway above the sidewalk after removal of the brownstone stoop. Prior to the Civil War the streets around Washington Square were among the most fashionable in the city. Wealthy New Yorkers moved into wide brownstone residences filled with costly furniture from the shops of Henry Belter or Joseph Meeks. West 10th Street, between the park and 6th Avenue, was one such street. At No. 14 a stylish Greek Revival home was built towards the end of the 1850s. Constructed of red brick with brownstone trim over an English basement, it was exceptionally wide and spacious. Here, throughout the turbulent war years, women in voluminous Victorian dresses and men in starched collars were entertained beneath whale oil chandeliers. The neighborhood, unlike so many other chic residential areas, retained its elite character even as most monied New Yorkers moved northward. Here the wealthy widow Mrs. James Boorman Johnston was living in the 1880s with her daughters. A member of the Colonial Dames of America, her husband had been a founder of the Metropolitan Underground Railroad and the Broadway Underground Railroad. In 1897 Fred H. Andrew was living at No. 14. A cyclist, he had the bad luck to collide with little 8-year old William Murtha on Hudson Street, breaking the boy’s leg. Andrew was arrested for reckless bicycle riding. It was in 1900, however, that the house drew the attention of the press and the curious when the author and satirist Samuel Clemens took up residency with his family. Years later Mark Twain’s daughter would recall “One could never describe the atmosphere of adulation that swept across the threshold.” This was reportedly Twain’s favorite among the several residences in which he lived in New York and here the author and his wife entertained lavishly. Twain was living here when one of his maid servants, Kate Leary, was overcharged by cabman William Beck by 50 cents for a ride from Grand Central Station to the house. When Twain confronted the man about the $1.50 fare (which should have been $1.00), the cabbie gave him a false cab number and fled. Twain’s butler chased the cab on foot to get the correct number. William Beck soon realized that 50 cents was not worth incurring the wrath of Samuel Clemens. Despite the piddling amount, Twain took the cabbie to court to prove a point of principal, resulting in Beck’s losing his cab license. 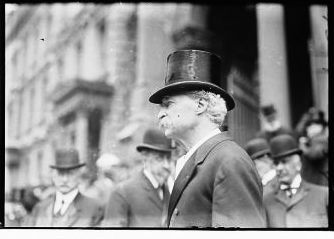 “What a damn fool that cabman was!” Twain said upon leaving the courtroom. Charles W. Wetmore, President of several concerns including the North American Company, leased the residence when Clemens moved out in 1901. Wetmore was a leading force in the New York Yacht Club and its annual competition for the Americas Cup. The list of wealthy residents continued when, later, the prominent John Farr family purchased No. 14. Farr, a leader in the sugar industry, was the Vice President of the Guayama Railroad and was on the board of several companies. The Farrs had two sons and two daughters. The house was the scene of elegant coming-out parties for both daughters, Edith and Frances. The Farrs’ names often appeared upon the society pages of The New York Times; especially for the highly-publicized and socially-important marriage in 1921 of Edith to William Montague Geer, Jr., the son of the Rev. Dr. William Montague Geer, Vicar Emeritus of St. Paul’s Chapel. John Farr died in 1933 and five years later Frances sold the house to the Fourteen Ten Corporation which immediately announced its plans to convert it into a 10-family apartment -- two apartments per floor. The grand brownstone stoop of No. 14 West 10th Street was lost in the middle of the last century, yet the street never lost its residential charm. The relatively quiet tradition of No. 14, however, was jolted when resident Joel Steinberg beat to death his six-year old adopted daughter, Jessica, inside the house. The subsequent discovery of his repeated physical abuse to both the sad-faced little girl and Steinberg’s common-law wife shocked the city and the nation. New York lore speaks of 22 unnamed people dying in No. 14 West 10th Street over the years, some of them haunting its halls; while some report that Mark Twain himself is seen on its staircase. Although it is called by some “The House of Death;” in fact, a score of residents dying over the course of 160 years in any residence would be expected, especially considering that wealthy Victorians and Edwardians normally received medical treatment at home, rather than a hospital. Haunted or not, No. 14 West 10th – even without its stoop -- is a charming and elegant row house on an equally-charming residential street.